In this guide you can find information on how to record motion and send it to an FTP server. To implement this example, you must have OZEKI Camera SDK installed, and a reference to OzekiSDK.dll should be added to your Visual Studio project. 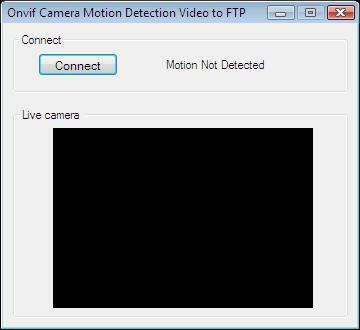 How to detect motions with an IP camera and send the captured video to an FTP server using C#? To establish the connection properly between your application and an IP camera you should apply the same code snippet what you have used in the example (How to connect to an IP camera device using C#?). Important: you should study this article in order to find out how to setup your Windows Forms/WPF Application correctly. It's also recommended to visit the Viewer side motion detection detection article before you begin to study this functionality. StartVideoCapture(string Path): This method starts the video recording. StopVideoCapture(): This method finishes the video recording. FtpUploadOnNewThread(): This method updates the recorded video. Notice, that in the ThreadingProcess() method you can modify the time period how long the camera should capture the actual image. The default value is 10000 (given in milliseconds). It's possible that the scanning process will take some extra time so the next detected scene won't be captured instantly. I uploaded a video, but I didn't find it there. Why? The uploading speed is slow.